Updade: I'm sad to report that the former Dinosaur World gift shop and restaurant have burned down. 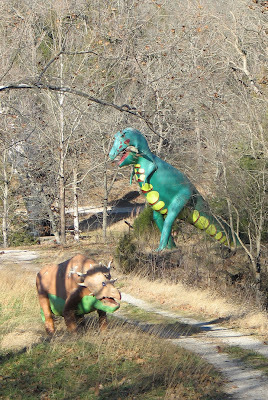 Dinosaur World of Beaver Springs, is a defunct roadside attraction that was a jaunt from the better-known tourist haven of Eureka Springs. I recently visited the remains of the place and snapped quite a few shots, so that I might share them here. And that, my friend, is the true origin of this internet blog post which you are reading...right now. During most of my lifetime this prehistoric landmark was called Land of Kong named for its 40 foot monument to King Kong which boasted flashing eyes and a soundtrack of gorilla growls. The place got a new name about the time America flocked to Jurassic Park to watch Jeff Goldblum. (Also some dinosaurs.) 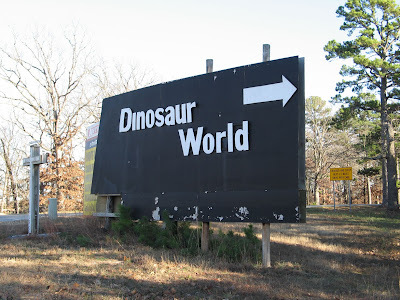 According to Wikipedia "the park was started in the 1960s" and though "it is the largest dinosaur park in the world" it has been "closed since 2005." Oddly enough, that was the same year Peter Jackson's King Kong hit the screens. It seems that they could have swapped names once more and been on the cusp of cultural relevance again. Though it has been closed down for nearly three years, no efforts have been made to communicate this fact on the numerous billboards (seen above) or directional signs that point the way to the former tourist trap. The dinosaur park is at least ten winding minutes off the main highway, so there's no telling how many barrels of oil have been burned by eager travelers fatefully racing towards the first defeat of their family vacation. The returning lane of traffic probably moves much slower as brooding parents explain the concept of false hope to their crestfallen children. But the trek isn't a total loss for those of us with an affinity for decaying amusements and cement cavemen. There are enough photo-ops available in the parking lot alone to support an argument for keeping the billboards intact, and almost enough fun stuff to even quench one's temptation to trespass deeper. A duo of excitable cavemen welcome one and all. The one on the left struggles to hold his ax upright. Close inspection reveals that these guys are actually no more than torsos; probably due to the prohibitive cost of caveman legs. 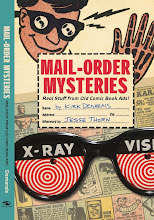 The glimpse of the letters "ND" hint at the original Land of Kong bone typeface. This is as good a time as any to point out that the park makes an appearance in the first few minutes of It's Alive (1969). UPDATE: See the Dinosaur World footage from It's alive HERE. In fact one of the original co-owners of Dinosaur World was American B-movie actor (and Shirley Temple's first husband) John Agar (1921-2002). 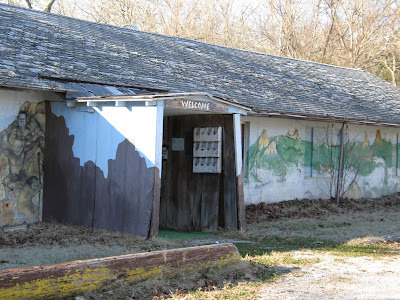 This building was home to the ticket booth, souvenir shop, and snack bar. Boom! Just like that- a free fun house mirror right in the entryway. You haven't paid a dime yet and your day just got 100% more awesome. Not only that, the laffs start to roll in for anyone who lays eyes on this single panel gorilla-related gag. It took me way too long to decipher their monkeyspeak. Translation: "Eat yet?" "Not yet. You?" I pushed the camera up to the door to get a peek inside. It's a wonderland of lattice and Corona boxes. The guy on the right looks like Jimmy Carter. Leftover satire from the 70s, maybe? I wonder if the guy in the trucker hat is the proprietor. The props have no regard for dimensional continuity. I like that. This is where the official tour once began. While it would not be difficult to breach Dino World proper, trespassers are challenged by the current caretakers who live in a home that overlooks much of the area. (I have friends who have been swiftly busted.) It would seem that guarding this Dinotopia would be a full time job. I imagine every year there must be a handful of disgruntled Clark Griswold types who vow to tour the park by any means necessary. The caveman torso lookouts are losing the battle. I wonder why so many tourist attractions are equipped with rickety swinging bridges of death. These bridges automatically divide visitors into two types of people- those who simply want to pass and those who take time out of their day for violent jumping and shaking. After my visit, I was driving away when I noticed a nearby gravel pull-off which seemed as though it were created solely for illegal Dinosaur World entry. In the name of blogging I stopped the car, walked down an embankment and and briefly set foot in the forbidden lost world where I took these last couple of photos. 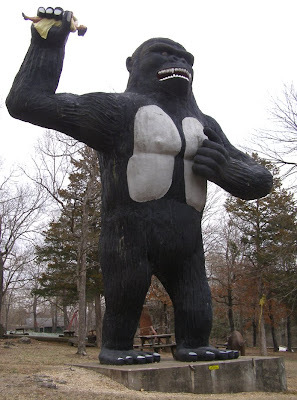 More from Wikipedia: "The sculptures were created by Emmet Sullivan, who also designed the dinosaur statues in Dinosaur Park and Wall Drug in South Dakota, and the Christ of the Ozarks statue in nearby Eureka Springs, Arkansas." 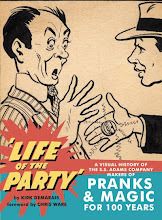 UPDATE: Secret Fun reader Flashfink offers even more information on John Agar's connection to Land of Kong via an obscure reference in Psychotronic Magazine, issue 9 (Spring 1991). Thanks Flashfink for using your powers of information finding! 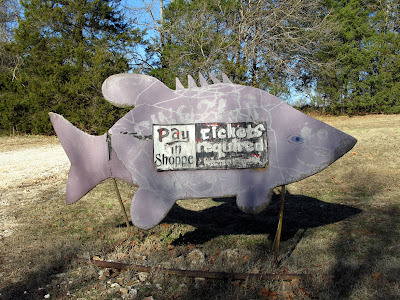 Agar:(Laughs) "Yes, in Eureka Springs, Arkansas. 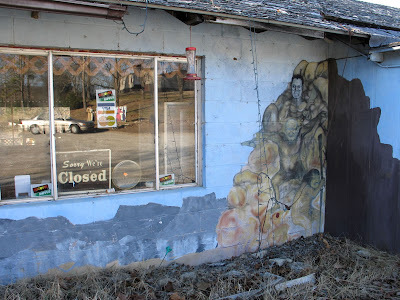 A friend of mine who's now deceased, Ken Childs, he bought this place that a farmer had built up with a bunch of dinosaurs and stuff like that on it. They wanted to build a King Kong and refurbish the existing dinosaurs there. They looked like cartoon characters, instead of what they would actually look like. It was like Walt Disney went down there and did them. Ken contacted a guy in Texas to build this Kong for him. The place was eventually called "John Agar's Land of Kong." I just let them use my name. I think it's still there. I've never seen the actual place in person, only photos. He was a friend and I just let him use my name. I guess he figured, since I was in KING KONG it had some relevance." If this is true and not the distorted memories of an aging alcoholic, it means that his roles in two of Larry Buchanan's films and the park's appearance in one more of them is nothing more than an (AMAZING) coincidence. I bet you could buy that enterprise for next to nothing, Kirk. Jon Agar just became even cooler to me. Thanks for that tidbit of trivia and another fine virtual tour. 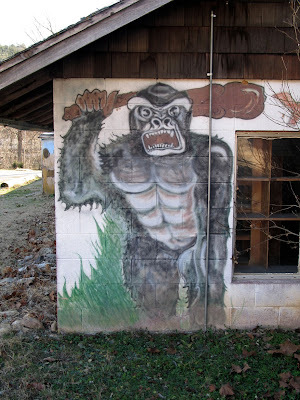 Alas, the one time I actually convinced my mother to visit Land of Kong on our annual pilgrimage to the Ozarks, it was closed. Now I may never behold the awesome glory of our prehistoric past. I can't believe this place isn't covered with graffiti! Maybe the IT'S ALIVE! monster is still around and keeping a(ping-pong ball)eye on things. I want to believe that if the guy on the right is Jimmy Carter, then the guy with the trucker hat is his beer-swillin' brother Billy! Why not? Fantastic writing as always. You are way more legit, and inspiring, than Ken Burns. Don't forget us little people when you are finally famous. I think this park appeared in the movie "Elizabethtown" also. Did you already post about that? It does look like the park in the movie. places such as this are like crack to me. you are truly a pillar of strength for not venturing further down the forbidden path. Man, if that place was in L.A. it would be ridiculously vandalized. So very well written. Reading your blog is always a treat. Seeing the remains of Dinosaur Land (Land of Kong) is both heartwarming and depressing...it's great that it used to be around...and it's sad that things like that just don't exist anymore. Yet it's that bittersweet feeling that magnetizes me to old, obsolete and antiquated stuff to begin with. I'm bummed as I didn't know that this place was closed. This has been on my lists of top places to visit since I heard about it 10 years ago. Yes someone needs to buy it! Is it for sale? Thanks for posting and thanks for making me depressed! Ah, sweet memories! My wife and I honeymooned at Beaver Lake in 1998. 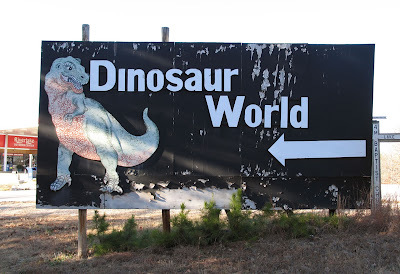 You can be sure that part of our romantic week included a visit to Dinosaur World! Well, we only actually made it into the parking lot. Now, I can't remember if the park was closed or if I viewed the giant spider as a portent of impending doom! 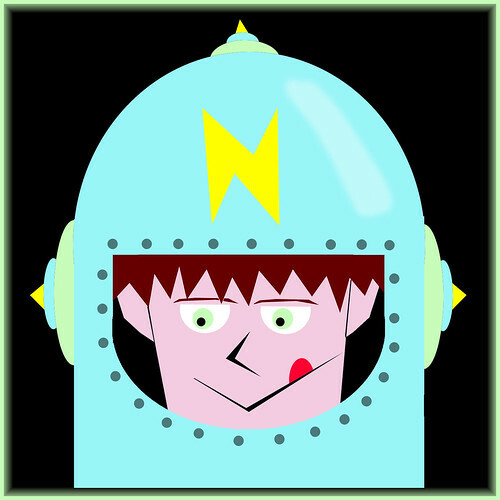 Thanks for the great blog and website! Thanks Rozum, Running a place like Land of Kong is exactly the sort of thing I would like to do when I retire. Seriously. Vintage reader- Your tale is tragic. I wonder if they had very sporadic hours. I've heard a number of accounts of people finding it closed, even during peak tourist times. bill- I'll bet you're right! Otherworldly powers are the only explanation for their pristine condition. das brick- Excellent theory you have on the Carter brothers! I did a google image search and the glasses and the cheeks are a match. I've yet to locate photos from a long haired trucker hat period but I wouldn't put it past him. And thanks too for your encouraging words. I'm destined to use your Ken Burns quote eventually. ha! plcary- You're right, I'd forgotten about that! Good call. They must have shot that right before they shut the park down. 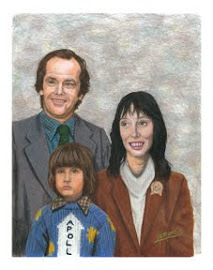 sharon- ha, well, I was there on Christmas eve and my wife and son were with me. I mainly didn't want my family to spend Christmas morning in jail. But in other circumstances I might have been far more adventurous. narvista- that gives me an idea for a movie. Someone opens a dinosaur park in L.A., all the vandals come out to do their thing and the dinosaurs come to life and kill them. Roger Corman can produce. But you said it- bittersweet indeed. brandon- my wife and I got married that same year and we started our honeymoon in the Eureka area too (before heading up to the traditional Niagara Falls) we might have crossed honeymooning paths. However, you have out-romantic'd me with your attempt to visit dino world. What was wrong with me? Finding old, hidden, and defunked places and treasures is one of my favorite things. This makes me wish I had a car. I would love to go wandering. I'm so happy to have discovered other people that share my strange obbsession. Very cool. Wanna go on a roadtrip sometime? Finding places like this is what I want to do when I get out of college. Just roam around and see even the closed-down sites. Such a shame that it's closed down, though. And even in my home state! THis is a real heartbreaker. I had no idea this place had closed down. My parents took me to Land of Kong when I was a little kid-- it left such an impression on me that I hauled my girlfriend down there to see it twenty years later. This was only four years ago-- we must have caught it on the final swing... As I recall, the woman working the front desk was very ill, which didn't bode well for future seasons at Dinosaur World. I wonder how much they want for it? This place is near and dear to me; thanks for the updates. Somewhere there's a Polaroid of me with one of the dinos from the 1960s. I remember when it was called John Agar's Dinosaur Park, after the actor who was apparently co-owner. The ownership history of the place varies with who you ask, and to really untangle it would probably take a visit to the local courthouse. I think it was also Ola Farwell's Dinosaur Park for awhile. I used to shoot slides every few years in the 80's to document paint changes on the dinos. We called the cheap plywood dinos "2-D-sauruses." I think they used to have some political signs too...and I seem to remember some slightly off-color paintings in the bathrooms, in true ozarky tradition. They sold cheap ceramic knock-offs of the sinclair mold-o-rama dinos with their name (don't remember now if it was Dinosaur Park or Land of Kong then) crudely written in the glaze, back in the mid-1980's. Man, I hope it in't sold and torn down for a resort. That type of large multi-material sculpture isn't easy to remove undamaged, so I fear a second extinction. Also, I think Wikipedia is wrong about the King Kong being there from the start. I seem to recall it was built around the time that awful King Kong movie with Jessica Lang was released. I lived in Eureka Spring as a kid in the late 70s (my dad owned Starkey Marina and my mom worked at the Crescent Hotel) and loved this place. I think Ace Jackalope is correct that Kong wasn't built until later. Sad. A little part of my childhood gone. 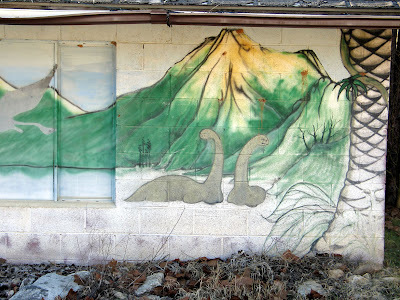 I share your sadness at the now-defunct Dinosaur park, which was also a family destination several times during my Northwest Arkansas youth. I only live about 55 minutes away from the place...I should go up there and check it out. 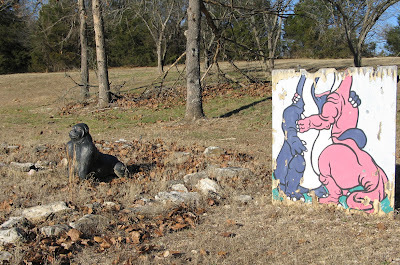 A couple of years ago, I got to explore the also-now-defunct "Dogpatch" amusement park near Jasper, Ar. It was left much as it was when abandoned years ago. 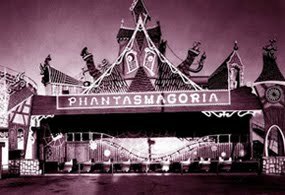 Like a haunted Scooby-Doo amusement park. It was fantastic. 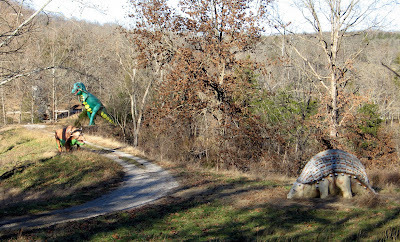 Oh, and also, speaking of dinosaurs, if you have ever seen the big concrete ones located in the Mountainburg, AR City Park...my father is the one who built them. Your blog and website is excellent! Thanks! "I didn't word my comment about John's "death" in the 1970s very well. It was a misunderstanding and not the result of any deliberate misinformation (at least not on Agar's part). I first read about it in Famous Monsters magazine (number 106, April 1974) when I was a kid. An article titled "The Living Ghost, John Agar" starts with a photo of him and the caption "dead at 52," followed by the words "you have never read an obituary like this in your life." The article then gives an outline of his career, focusing on his appearances in monster and science fiction pictures - but leaving out his two Buchanan films (CURSE OF THE SWAMP CREATURE and ZONTAR THE THING FROM VENUS) as well as a cheapie called NIGHT FRIGHT that he made in Texas around the same time. At the end of the "obituary" however, its author (editor Forrest Ackerman) reveals that it was all a mistake (the article, not John Agar's career) and that Agar turned up at something called "The Witchcraft and Sorcery Convention" in Los Angeles. Apparantly nobody was more surprised about the news of his demise than John himself. "I shook his hand and the guy marvelled at my handshake. For five minutes that's all he talked about. The handshake. Eddie told me this story; he and John Agar were drinking together, watching the news on TV, and they had John Agar's obituary." "It was ABC. That's a true story. Ed said, 'You're not dead and I'm gonna tell 'em.' I told him 'Forget it, I don't care what they say.' Well Ed called up the television station and said that I hadn't died, that I was sitting right there with him , and I went in the next day, and they put me on the air." Hello, My grandpa Ken Childs (not Chilles)owned this park I remember going there when I was 6yrs old. After his untimely death. It was run illegaly for a time under the name Dinosaur World. Gladly it will never be able to be sold. Thank you for the pic's and the memories. My grandpa loved this park and loved to play pranks on the visitors. He was a great man. He also named it after his friend John Agar. John was never a co-owner. I wonder how the movie Elizabethtown got clearance to film there? I remember Grandpa sending pic's of the construction of the big monkey (king kong). The VW bus that was there my dad rebuilt the motor and we all drove from Utah in it. What good memories they are. Hey, thanks for sharing another bit of info on this mysterious place! Ran illegally? Wow, that's interesting. How was it illegal? No license or something? Your grandpa helped create so many fond memories and experiences for so many people. My grandpa was a lot of fun. As far as being run illegally it's a long story, but the estate was never settled. I would love to go back and see the park. The summer I spent there was awesome. I visited this place a few times as a child and had great memories, as well as some pictures of me under the giant Kong and T-rex. This morning my new wife and I were leaving Eureka Springs and i wanted to show it to her. 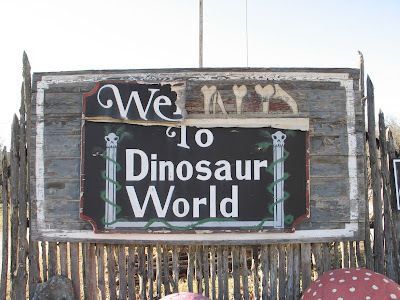 There are now "for sale" signs on the huge Dinosaur world sign, as well as a for sale sign on the double wide trailer that is there on the property. Since no one was there, we were brave enough to go under the gate and take another pix of me under the giant Kong, a replica of the picture my mom took 17 years ago. Also got a few good pix from the road. So who DOES own it now that is trying to sell it, and will it be re-opened? Glad to hear that the signs are marked and the tourist disappointment levels are sure to drop. Cool that you got in for pics. I have no idea who currently owns it, but I'm certainly interested to see who buys it. I remember going to this place when I was a child with my parents. I was maaybe five or six years old and LOVED every minute of the fun. Never hearing of the place closeing down, I was planning to take my two children (six and three) this summer. 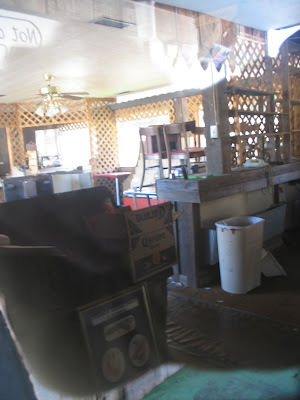 I am very upset at the idea of them never getting to see the place for themselves, but I know I have about 50 pictures of the place back in it's glory days. I just need to go to my parent's house and find them. Thanks for the blog so I won't go all they way there just to upset my children. Kristy- well, I'm glad that at least you were able to find out it was closed before you got there. That would have been so harsh. I still hold a glimmer of hope that someone might reopen it, but I know the odds are against it. Maybe as an alternative you can research some good Storybook attractions or a Santa's Workshop and take your kids to that. Or there's always Rock City in TN. Fixed it! Thanks for the correction. Not sad to see parks like this go - they give the wrong impression about history to kids. Want your kid to learn something? Take them to the Natural History Museum in DC. I am in Eureka Springs right now. I have been trying to get up the guts for the past 3 years on my annual trips here to trespass form photos and hearing the above comment a few up from here I think I actually will this time since someone else was able to! I'm pretty excited!!! Hey Likeursoperfect, I thought u said it will never be available for sale. Why are there for sale signs now? I went to Dinosaur World as a kid (when it was Land of Kong) AND as a grown up (not realizing we were there the last year it was open)! Anyhoo, I blogged about it and linked to this post, because these pictures brought back some great memories. Thanks a bunch! I stopped at the park last week. I didn't know about the closing and was hoping to renew my memories of visiting 20+ years ago. Oh well, some memories are better left alone. In any case, the only for sale sign was for the mobile home parked on the hill. I did not see any sign that the park itself was for sale. we just visited the place still closed and falling apart, I wish that someone would reopen it....it is a shame to see that beautiful piece of property to go to waste. My family and I went on a camping trip in Arkansas about 15 years ago. My son was 7 or 8 and my daughter was 3 or 4. We picked up attraction brochures at a rest stop and my son zeroed in on the on for Dinosaur World. All week he kept asking when we were going to Dinosaur World. I have to admit, I was a little disappointed when we finally did go there because of the hoakiness of it, but the kids had a great time. My son still talks about it to this day. I loved this blog. 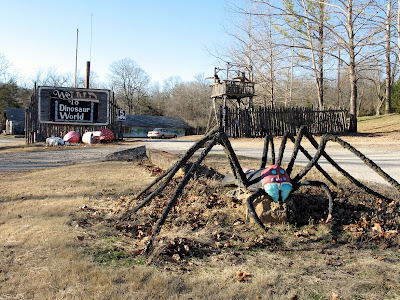 I'm obsessed with exploring strange roadside attractions and was devastated when I found out the the number one destination on my list, Dinosaur World was closed! In memoriam, I'm writing a paper for my college history class, and was wondering if anyone could provide any non internet sources about Dinosaur World. Or, it would be amazing if I could get an interview from one of Ken Childs' grandchildren! Thanks so much for any information anyone can share! Christine, click on the profile for Likeursoperfect (above) and you'll easily find an email address for one of Childs's grandchildren. Good luck on your paper! I really hate to hear this! I went all the time when I was a kid as my grandparents had a cabin down at Shell Knob, MO and we'd always drive to see the park. About 6-7 years ago I took my wife down to the park to re-live my childhood. They were open and while my wife thought it was weird and very ran down...I loved seeing the thing from my childhood. Children don't look at things like paint peeling off etc. I guess we barely got there in time. If I was retired and wanted to live in Arkansas I'd be all over buying that place. You could really leverage today's technology to really liven the place up.. It's now Jan 2011...has anything happened with this property? I was planning on taking my kids down to Eureka and this was going to be one of my stops. Heck, I might still drive by and show them it from the road. Might risk it to get my boy a pic by Kong. FYI to those with kids mad. Go to Eureka and go to the Passion Play. There is a dinosaur museum (or at least there was several years ago) there. Crimson Moon- I haven't heard of any developments except that someone told me they finally removed (or painted over) the signs on the highway. You should definitely take a look at the parking lot, there's plenty to see. I would love to see someone reopen it someday. ilovegems2, seems we have family history. Ken was married to Aunt June. I have a very special place in my heart for Land of Kong. My Grandfather, Ted Prysock along with other relatives, ran the store and other daily operations of the park. The painting on the side of the building is very dear to me. The man in the middle (with the trucker hat) is my Grandfather, Ted Prysock. My Great Uncle, Bob Prysock passed away a couple of years ago and several of my family members went on one last ride throughout the park. I went their as a child and I was so thankful that my daughter was able to see it. I would have LOVED to have gone to there when I was younger!! 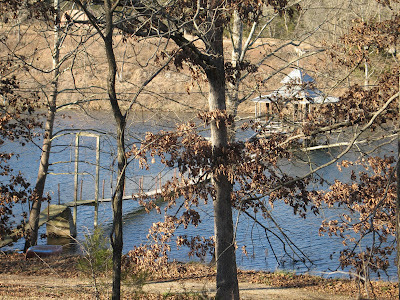 I actually live in Eureka Springs and drive by the old park as often as possible and daydream about owning it. It breaks my heart to see it slowly deteriorating. We drove by it a couple of days ago after the flooding and it was devastating! The pond with the draw bridge was flooded and full of debris that's over the top of the bridge. I've got a photo of the moose(?) and it looks like they're treading water! If I ever win the lottery, it's mine and you're all invited!! My grandfather owned "John Agar's Land of Kong" in the early 80s. I spent the summer of 80 living there while my mother and step-father ran the park. 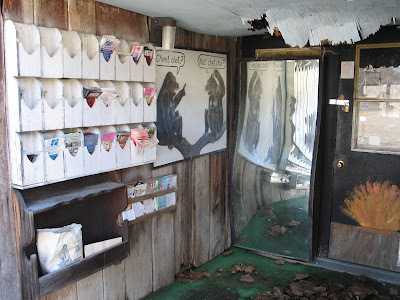 As you look at the entrance to the gift shop, the left side used to be a restaurant. On the outside wall, beside the front doors, the awning did not exist at the time. 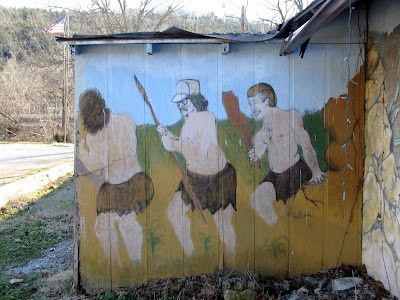 I watched as they painted the "cavemen" next to the entrance. I don't remember the name of the individual whose likeness was used on the first caveman on top, but the one in the middle is my grandfather, Ken Childs, who owned the park with his wife, June. The one on the bottom was my stepfather, John Wrightsman. King Kong used to be a wooden figure on the opposite side of the highway from the park entrance, and held the Iatolah Komeini (however it's spelled) in a noose (it was built when we were having issues with Iran, I believe in 1979). 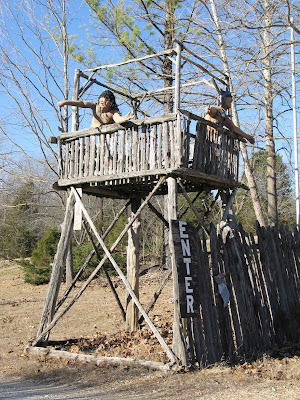 The cavemen on the tower at the gate used to be inside the park. I don't know if it still exists, but on the right side as you enter the park, there used to be a huge dome with a moonscape on the top, and inside was what was deemed "the world's largest Noah's Ark Mural." We used to use that dome as a shelter when "freak" storms hit and we didn't have time to run home, or if the weather was tornadic. 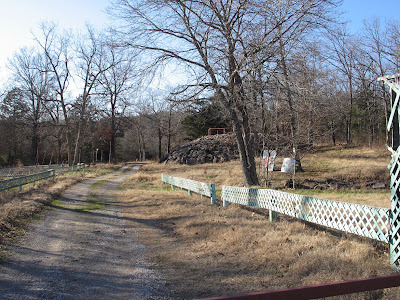 We lived in a trailer on the top of the hill to the north as you enter the park from the highway, and before you get to the gate to the park (the gravel driveway at the gate was our driveway and there were several trailers on the top of the hill). The side of the highway were Kong used to stand with the Iatollah, used to be a campground that was also run by the park. 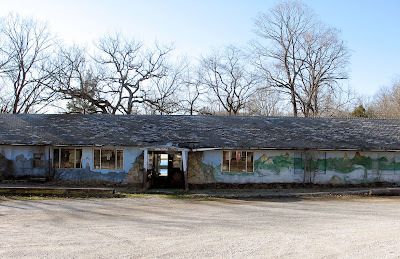 I was just looking at Google Maps of the area, and apparently that has been closed down and the building that had the laundromat for the campers has been removed. My grandfather died on June 30 of 1984 while in Eureka Springs. His wife kept the park and some of us who had hoped to return to continue running the park, did not get to do so. I normally don't leave contact info, but if anyone would like to write to me about the park and what has happened with it over the years, I can be reached by searching "Spencer Kenneth Jones" on Facebook. I have many memories of that park - some good, some not as good, but it is still nice to reminisce and see what has happened to it over time. Wow, Spencer, thanks for the insight! It's like a virtual family reunion in this comments section. I've lost track of who's related to whom. I just wish someone had some pictures of the good old days. Kirk - I will do some checking around. I know I've seen some pictures from when we were living there and running the park. I know some were lost in a house fire and others misplaced while we were moving, but let me know how to send them to you. As mentioned, I'm on Facebook so you can find me there. Just search "Spencer Kenneth Jones" and I think I'll be the only one to pop up on the results. If I find a few I might just put them in an album on my page. The owners if the park also own the spider creek resort nearby. We stopped and talked to them about the park, but couldn't get the courage to ask for permission to go in. We snapped pics from the road, not brave enough to trespass, and just left with the childhood memories of the land of kong reopened. If anyone gets access to it that would be great! I was just here a few days ago. Never once saw a "closed" sign on the way. I lived in Eureka in 2005. Never had the desire to see the park. My stepfather catered to the crew filming Elizabethtown. My 4 year old is going through a dinosaur phase so while visiting my mother we decided to go. No for sale signs either, just the normal "no trespassing." We pulled over on the side of the road so my boy could see the dinos. I intend to go back this winter when the trees have lost their leaves so we can see more. here it is, this was the linkt hat the eureka springs page took me to! Hi Anonymous- Glad your wild goose chase finally got you here. It seems to be an out of the way spot for folks with Dinosaur on their mind. Welcome! Just visited Dinosaur World yesterday. I have been out there numerous times just to look, even went in the gift shop before it burned. The house overlooking the main entrance has been abandoned for over a year now. We just parked on the side of the road and walked around the entire place, didn't seem that anyone passing by cared. Clearly people still use the place to fish in the pond, and the rickety swing bridges are still usable, just watch out for missing boards! Seeing the King Kong in person was amazing! It is also incredible how good of shape everything is in, glad I finally saw all of it up close before something else happened to the place. Abandoned house you say? I guess nobody's watching too closely if someone burned down the gift shop. Perhaps it's time for another visit. I'd love to see that King Kong again. Ya no one lives in that house anymore and all the cars that passed by did not even look over or seem to care. The lady that runs the razorback gift shop close to Pivot Rock said that its not a problem to walk through there. It is amazing how it is not as grown up as you might think. My dad's cousin, Orvis (Jessie) Parker and his wife Mary both worked here when it was knows as Farwell's Dinosaur Park. Not only did Orvis help construct the dinosaurs, they ran the restaurant and souvenir shop. 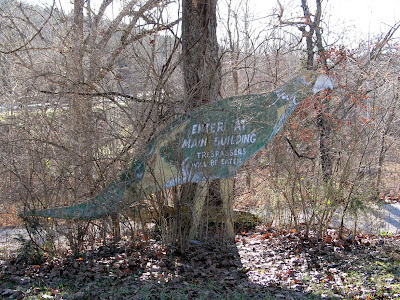 In fact, Orvis built a dinosaur and delivered it to our home in Kansas around 1970. I have lots of pictures to share, some that include me, but am unsure how to add them to this blog. I'm not sure why the Farwell era of the park doesn't get mentioned in many online histories. If they're too big to email let me know and I can figure something else out. Loved this article, great pics. Thanks for the order and the link, your blog looks cool! Sorry to hear this place has closed. I went there in the late '80s and early '90s with my grandparents, then again a few years later with my cousin. I doubt he remembers now, as he was only a toddler at the time. But I do. I always wondered where this place was. 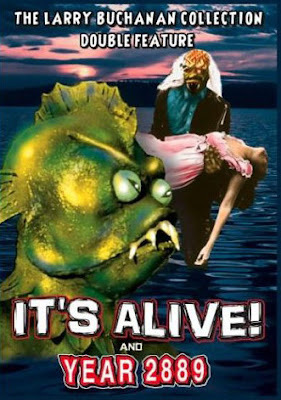 Larry Buchanan's It's Alive is a fond memory growing up watching Saturday afternoon creature features. That movie was filmed in 1968 at the park and this was the year the park opened..those dinosaurs I don't even think were finished at that point. 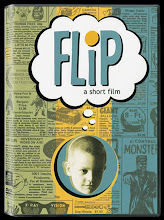 Just a cool creepy setting for a great low budget gem from the past. Hi all. My name is Mike. 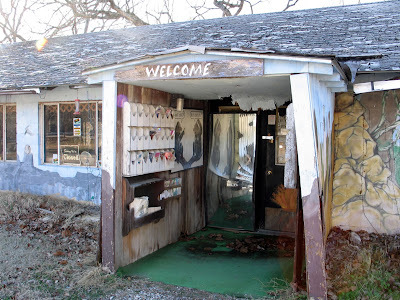 I too visited this place back in 1999 on my honeymoon to Eureka Springs. Even though the dinos were kinda cartoonish looking, the place and its surroundings were awesome. I hole hardheartedly paid the admission price, and enjoyed every min of that place. I returned for another trip to Eureka with my wife in '08 I believe it was. Only to find Dinosaur World had closed. Well, fast forward to today. Yes.....today......June 21st, 2013. Myself and my wife decided to return once again to Eureka Springs for our 14 year anniversary since we only live a few hours away in N.E. Oklahoma. During our stay, I asked everyone I could find....shop owners, locals, even a few cops in E.S. about Dinosaur World. All said the same thing.....that it was a shame it closed, and that nothing was really slated for that piece of property at this time. I did however work up the nerve to visit there again. Prior to that though, I stayed up late last night reading this blog, and several others about Dinosaur World. I hadn't realize how much of a following that place had. It's really sad and disheartening to hear about the fire, the closing, and what's happen to the dinos out there. Forgive me folks.....I mean no disrespect, but I had to see for myself. I not only visited the park again. But yes.....I entered and snapped over 30 photos of the grounds, the dinos, and even that poor Kong that had fallen. I want to post the pics here, but I want to see if this blog is still monitored by the moderator. There is a silver lining to my story though....... amazingly enough....the dinos still look good!! Rex is still there, and so are most of the ones I remember. The grounds look like they could use some attention....but for the most part......it's all there.....untouched by the passage of time....and as crazy as it sounds...it almost brought a tear to my eye walking through the grounds. I'm an old Dinosaur nut anyway folks. I grew up watching Land of the Lost, I drive a Jurassic park Jeep, and seeing something like that park falling into disarray is really upsetting. But it left me with a good feeling that even with the place no longer in business, the grounds all grown over, and no signs of humanity anywhere....that the dinos still are standing their ground. Most still look pretty good. Just some of them could use a new painting and some cleanup. Upon my comment getting approved, I'll post all my pics I took if this board would like to see them. And again...they are pics as of June 21 2013. Hi folks, it's Mike again. I thought I'd share some of the pics I spoke about in the comment I posted just before this one. Not sure if anyone is still monitoring or reading this blog, but since an html preview isn't possible from what I can tell, I was curious to know if anyone can answer which html prefix to use? A direct link? Or the IMG code, like from photobucket. Lemme know and I'll post the pics. It's heartbreaking seeing Kong on the ground, but you're right, the rest are doing surprisingly well. Thanks for braving the lost Dinosaur World for the benefit of all of us! Thanks so much for this! I remember my mom taking me and my brother here when I was about 5 or 6 years old. I'm 25 now and still remember that place! I loved it. And hey, you missed the bathrooms! They are about the best part. In the women's there is a life size painted wooden cut-out of a man pulling up his zipper with a shocked expression on his face. The same with the men's only its a woman. Haha, not only was it pure entertainment just to sit there close to the restrooms and see people freak out when they thought they had walked in on somebody... but also to see them check the sign on the door! My grandp orvis parker and my grandma mary parker owned and ran this park for many years of my life growing up...they ended up selling when the state started taking land there and took most of thiers..it was the greatest thing in the world for me my sister and all of our cousins to grow up stomping around the park..my grandma passed away a few years ago but my grandpa lives about a mile from the park and has MANY dinosaurs in his yard to this day..i thought they both should be recognized for what joy they gave everyone while the park was thiers!! The guy in the trucker hat was my Great Uncle, Ted Prysock. He worked in the park for quite a while. I was always told that John Agar was a part-owner in the park, along with my Great Aunt, June Davidson. My Great Grandmother, Jessie Prysock was a cook in the little cafe/grill in the shop. My last visit was in 2009, after the death of my Great Uncle, Bob Prysock, who was caretaker of the park until he died. In the early 80's, during the "Land of Kong" days, the signage featured Kong holding up a figure of Ayatollah Khomeini. I have very fond memories of this park from my childhood, and all the dinosaurs were still there as of my last visit. The park was sold shortly after my Uncle's death. Evidently, the new owner hasn't decided what to do with it yet. to dinosaur world. I also built and refurbished. 40 replicas.I did all the airbrush work as well as designed the ape. In the 10 years I worked there I received no recognition. I just love it when somebody decides that your name is not worth mentioning. 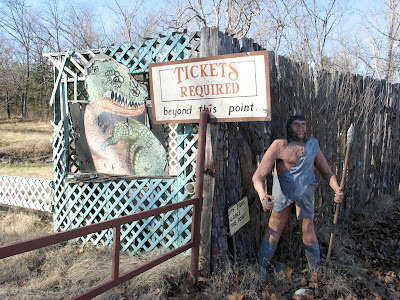 There is no such place as "Beaver Springs" Dinosaur World property is approximately equidistant from EUREKA SPRINGS and the town of Beaver (though getting to Beaver is time-consuming for the outsider, I assume, and a bit confusing). My grandfather used to take me and the other grand children here every year up until his strokes . I hope it reopens . I would love to be able to take my children one day !